Linda Okello, the police woman with a mamoth b@@ty made headlines after she was spotted with a 'tight' skirt that exposed her massive 'German juice,' to the public. 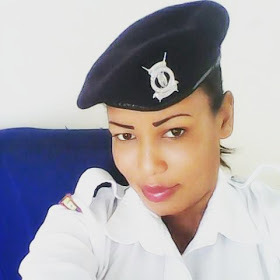 I know many consider her as the hottest police woman to ever grace the 'utumishi kwa wote' uniform but you are wrong. ladies and gentlemen, I take this opportunity to introduce to you the the most beautiful police woman ever. Please do enjoy!